Please take a moment to meet this week’s City Face, Carla Yaquinta. How long have you lived in Bridgeport? We moved here from Rockville, MD in August 1995. Where are you originally from? Clendenin, WV- attended Herbert Hoover High School. Are you married? Yes, to John Yaquinta. Children? Two. One son, Tony, and a daughter, Gina. Where do you work? I’ve been a dental hygienist at Hazey Dental Associates for 20 years and have been practicing dental hygiene for 37 years. Favorite place outside of WV? Punta Cana, Dominican Republic. Best childhood memory? Family trips to Long Beach and Cocoa Beach. Hobbies? Love watching college football and basketball especially WVU. Editor's Note: Cover photo is Carla and her two grandchildren Jimmy and Elsie. 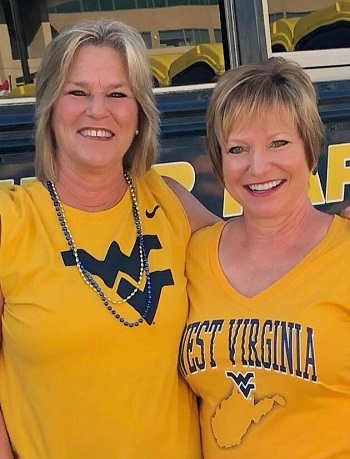 Inside photo is Carla with her sister, Anita, at a WVU game.